Despite plunge in the oil prices, the construction sector in Bahrain has remained resilient and growing at an annual growth rate of 7.2% over the past few years. The total value of projects that have actually broken ground more than doubled from a total of $1,251 million in Q4'15 to $3,056 million as of December 2016. During the same period, the value of projects which were applicable for tenders rose by 20.5% to $4,262 million. According to 6Wresearch, Bahrain air conditioner market size is projected to grow at a CAGR of 4.5% during 2017-23. Contracts worth more than $395 million funded by Gulf development programme, has been awarded to the contractors for development of housing units across the country. Additionally, announcement of tenders worth $300 million for projects related to infrastructure is expected to drive the installation of air conditioners in the country. Centralized air conditioner segment has been the fastest and best performing segment in Bahrain air conditioner market followed by the split segment. The segment, predominantly VRF has emerged significantly over the past few years and is expected to lead the Bahrain air conditioner market forecast revenues over the coming years as well following the strong demand among residential and commercial applications. Amongst the end user applications, sales of air conditioner units in the residential sector accounted for largest Bahrain air conditioner market share in 2016. Bahrain witnessed considerable growth in residential construction sector over the last decade. Government of Bahrain earmarked $3.2 billion to construct 30,000 housing units in 2016. The Bahrain air conditioner market report thoroughly covers the air conditioner market by AC types, applications, and regions. 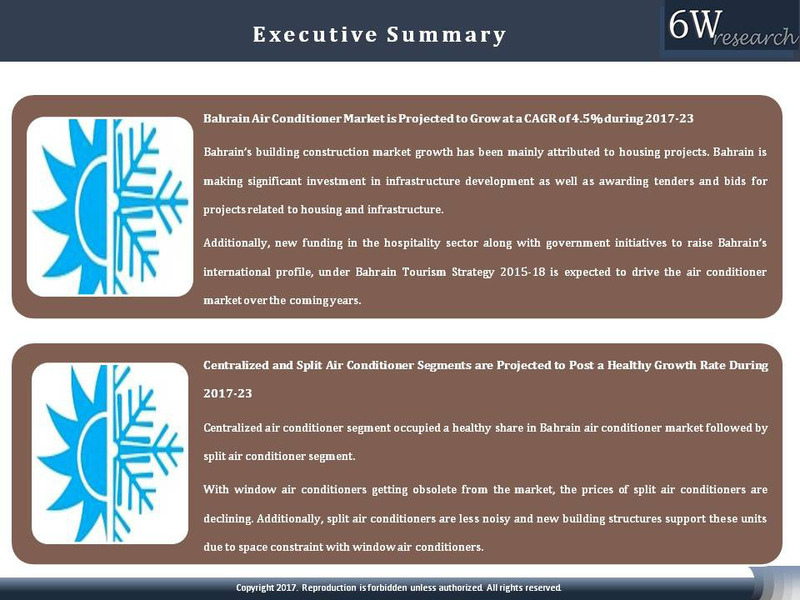 The Bahrain Air Conditioner Market outlook report provides an unbiased and detailed analysis of the on-going Bahrain air conditioner market trends, opportunities/high growth areas, market drivers, which would help the stakeholders to decide and align their market strategies according to the current and future market dynamics. 12.5	GREE Electric Appliances Inc..